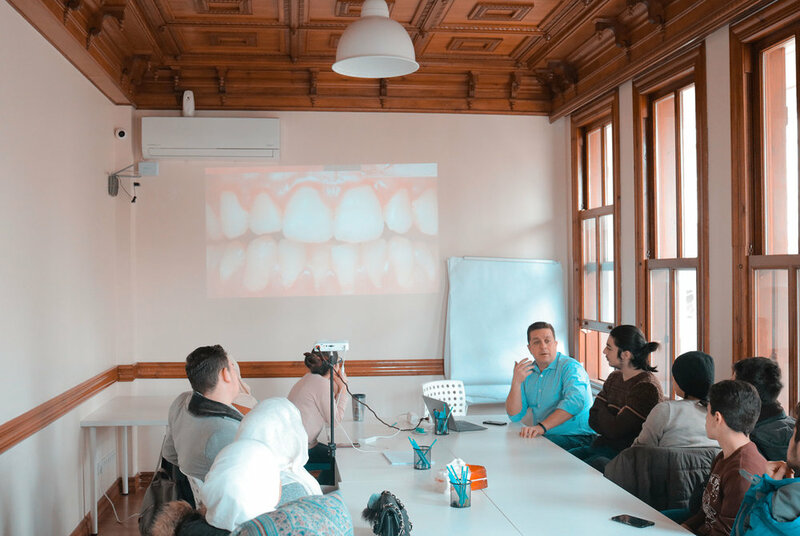 Omar Salem, a Syrian-American dentist, hosted workshops at both Karam Houses this past month on dental hygiene, teaching students about different specialities, what a dentist does day to day, and the steps one has to take to become a dentist. In addition to providing information about dentistry as a career, Omar taught students how oral cavity health is related to the entire body. Born and raised in Damascus, Syria, Omar fell in love with orthodontics at a young age watching his father, who was the first orthodontist in Syria, treat various types of cases. This aspect of storytelling is something visiting mentor and Syrian journalist Hala Droubi is extremely familiar with. On Hala’s first mission to Turkey with Karam Foundation. she found that the students were extremely interested in her career: it was their curiosity about journalism that drew her to host a journalism workshop in the first place. Hala explains that her workshop is constantly developing alongside the dynamics in Syria. When she first began teaching at Karam House, her workshop was mainly about the ethics of journalism as news and stories became central to the students’ lives during the revolution. Now, eight years into the revolution, Hala focuses her workshop on teaching students how to tell long form stories and share their histories accurately. Hala’s most recent workshop focused on the values and skills found in journalism including: accuracy, trust, curiosity, and the meaning of facts. She explains her decision to focus on these values by adding, “These students in the classroom are too young to decide whether they want to be a journalist or not, so you want to give them skills that they can apply to their life and that they could also apply to if they want to be journalists.” At the end of the workshop, students were required to interview unfamiliar individuals, collect a story, and create a board with all stories that would then be displayed inside Karam House. We are so excited to announce that our Guest Mentor application for summer 2019 is now open! If you are interested in hosting a workshop at Karam House and having an experience like Omar and Hala’s, please click here to apply. If you have additional questions, contact leena@karamfoundation.org.